I got the chance to sit in on a Staining 101 session at the Haven Conference back in June, and I thought I would share some of the things I learned, plus some old tips & tricks for staining wood that I’ve learned along the way! 1. Stain comes in oil or water-based products. Oil stains have longer drying times, which will come in handy if you’re working on larger projects like floors, paneling and doors. Water based stains are low odor and fast drying which will allow you to stain and finish within 24 hours. 2. Oak is the easiest wood to stain. Pine make look great, but can often stain unevenly (especially due to the knots). 3. Use a pre-stain conditioner that’s water-based. It’s gonna be like your $5 insurance policy. Use a foam brush to apply a thin coat and let it dry about 3-4 minutes before applying your stain. Give it a light sanding before staining, too. 4. Apply a liberal amount of stain in sections and wipe with a rag. Remember the longer you leave on stain, the darker it will get. 5. Always stir your stain before staining since some of the color pigments can settle at the bottom of the can. And never shake your stain! 6. Sand before you stain and always sand in the direction of the grain with a light 180 grit sandpaper. Oh, and never sand after you stain either! 7. Apply a top coat after you stain your wood. A water-based polycrylic is best! And yes, you can use a water-based top coat even if you’re using an oil-based stain. 8. Don’t apply stain too thickly. Leaving extra stain on top of your project will just peel off later. Instead use multiple coats to achieve a darker look. 9. You can use a foam brush to apply your stain before you wipe off, but do not use a foam brush for your finishing coat! 10. Looking for a stain and finish in one step? Try the new Minwax Express Colors! It’s like a cream that you can wipe off quickly with a rag and you’re good to go. It comes in 4 colors and 4 wood tones. Love the finished look! Or you can use Minwax Polyshades which is the stain and polyurethane in one step in liquid form. Now of course there are a bunch of other stains and polyurethanes on the market, but Minwax just happens to be my favorite! Plenty of color options and it’s just a name I trust! 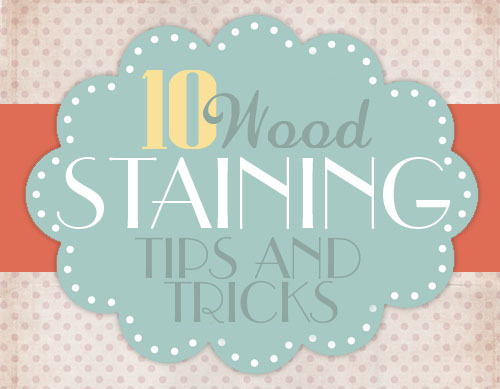 Definitely a must for the best tips & tricks for staining wood! Great post! Jon really enjoyed this class and although he had been staining for quite some time he had no idea about the pre-stain wood conditioner! Polyshades is a terrible product. I just returned a can if it and got a normal stain and polyurethane top coat. The extra effort is worth it. The polyshades is very thick and hard to get an even coat without drip lines or puddles. But thank you for the other tips. Totally agree I am having to sand off the excess that dripped over the sides. Thanks for the tip Dennis! Thanks for the tip Angela! Yes you can use pre conditioner but when using colour express you are best to just go for it then let it dry overnight. Sand the first coat lightly with 1200 then apply your second coat. Im wanting to stain butcherblock countertops. Which would wood species would be best for staining dark, Maple or Cherry? You want to use a hard wood rather than a soft wood, like a walnut, cherry or oak. Use a pre-conditioner as well to help even the stain! We have dark walnut Butcher block countertops. Have you ever considered just using Butcher block oil? This way they are food safe and, if you get a ding in them, you can just lightly sand with 320 grit, and reapply the oil, and they’ll look good as new! And DO NOT leave your stain rags bunched up! Lay them out flat or put them in a big bucket of water! Thanks for your post. It’s very helpful. I did use the polyshades and LOVE IT! It’s so easy! I wiped on the first coat and then used a foam brush for the other 2 coats ( it’s going in my kitchen, wanted the extra coats just for protection from spills and such).I didn’t have one problem with it.Thanks a bunch. You’re welcome! Glad you had such a great success!! I agree too, it covered more like paint than stain, came out way too glossy, and hid the wood grain. It also remained a also a sticky mess the next day in my futile efforts to repair. I had to strip the wood project and started all over again. I found that an based stain with a few coats of Verathane was the only way, and well worth the extra time time to do it right the first time. Live and learn. I wanted to add a trick to your arsenal. In my search for a perfectly matte, invisible finish, I’ve learned to use paint BASE. Pick up some of the exterior, latex base used for dark/black paints. Sometimes it’s labeled a 4 or 5. The base has the preservative/protective/UV components in it, just no pigment. It paints on horrifyingly white, but dries, really, invisible. Even raw wood looks … raw. Unlike the darkening other clear coats cause, or the yellowing of oil, this stuff causes your piece to look like it’s never been sealed at all. I’ve also learned it seals chippy items without the glued down look other top coats leave. But try picking the chips off! Anyway, the clear paint base is an incredible, durable finish that even works on outside projects. I know you’ll find some things to experiment with and probably take this idea and run with it. just found you via Pinterest and I’m so glad I did! We’re fixing to start a total home remodel and we’re putting in wood panels and new cabinets… (by WE I mean my hubby) but I have to do the staining and this info will be super useful! (I’ve never stained before only painted) THANK YOU for your post! Yay! Good luck to you!!! Thank you for posting this! So helpful. How should I apply the Polycrylic finish? You can use a brush, but only get about 1/3 of the actual bristles wet. This will keep the poly from drying out and leaving streaks in your wood! Hi there. I just stripped, sanded, pre-stained, and stained by bed over the weekend. Last night I applied the Polycrylic coat and it totally ruined the beautiful stain I achieved with streaks and blobs. Is there any way to fix this without having to sand it all down and start again? Did you only do one coat of the polycrylic? Sand with very fine sandpaper and then apply another coat. Make sure your brush strokes are all in one direction (plus make sure you use a high quality brush and only get about 1 inch of the brush wet). Hope that helps a little! Good luck! I have an outdoor swing that is made of Mahogany. The original finish has worn off, and I had it refinished by a furniture refinisher. The finish wore off in six months. Cam I do something myself to make it shine again. My late father-in-law built this swing for my wife, and it really is beautiful. I tried the polycrylic years ago and hated it. The finish was soft, it dinged and scratched as easily as a cheap layer of latex paint. I use a lacquer based varnish (Watco Lacquer Finish) and love it. It dries fast, usually dry to the touch in 1-2 hours and can be sanded and refinished multiple times in a day. The resulting finish is very hard and durable. You do need lacquer thinner (not paint thinner) for clean-up. Thanks for the tip David! you mention mutiple using multiple coats, can you use more than two or is that not recommended? You can use as many coats as you’d like to get your desired coverage and color! Just used PolyShades to change a maple color china cabinet to Bombay Mahogany I sprayed the material on and it came out excellent. very pleased. Will use PolyShades again. Glad to hear it worked well for you! I have differing opinions on 2 points. Foam brushes: I always use foam brushes for finish coats, and always get good results. Shake stain can. You don’t want to shake a can of polyurethane top coat, but there is no disadvantage to shaking a can of stain. I am not sure what or how you are staining wood. But stain is best applied liberally and wiped off . That is to say all excess removed. Not scrubbing it off.. stain is not ment to be layered. And the color will be consistent. Correct. I apply and wipe off, but sometimes a second coat is necessary to get a darker color (or if you want to touch up areas that may not have taken the first coat well). Why should stain not be shaken? You don’t want to get air bubbles in it. You could see it in the stain. Stirring is much better! Thank you for posting this! So helpful. How should I apply the Polycrylic finish on wood chess pieces? I would probably use a spray poly on wood chess pieces to get into the grooves. It will help keep you from overcoating with a brush. Hope that helps! I had used Min Wax polyshades on a project and it refused to harden. I went on line and found several others who had the same problem. Did they solve the hardening issue? I have not used it since. I’ve actually moved more towards waxes than poly. I was often getting brush strokes, hazing, or non-hardening like you said (probably due to the humidity in my area). To even out an oil-based stain you can rub lightly with mineral spirits. I did this with two handrails and it worked well. It’s interesting to know how to perform wood staining, especially the part where you need to sand the area before applying the coat. I have plans of renovating my home in a couple of month’s time and one of my plans is to change the finishing of the entry door. I thought about doing this myself, but because of time constraints and my lack of knowledge in wood finishing, it will be best to hire an expert to do the quality work for me.